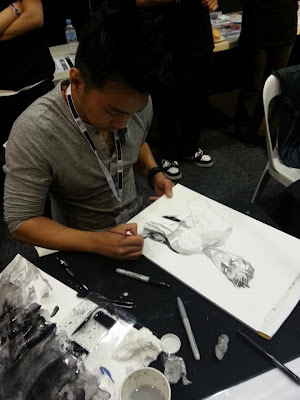 The comic penciler is part artist, part cinematographer, director, set designer and choreographer. In the film industry this would be the job of many talented people. In comics, it’s one supremely talented person. Also, unlike those other professions, you can get an original piece of their work, created just for you. 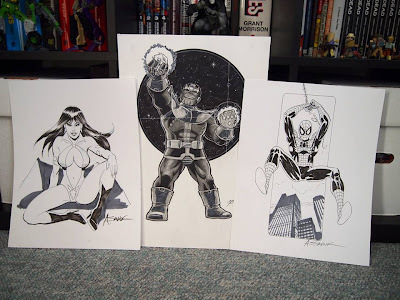 You can’t go and get yourself an original piece from legendary cinematographer Roger Deakins but you can have an original piece by the immortal George Perez on your wall. It’s really a unique thing in pop culture. Now I’ve gotten good handful of pieces done and often get questions from people on the cost, how to go about it and so forth. I have commissions from Nicola Scott, Francis Manapul, David Yardin, Mark Brooks and Matthew Clark among others on my wall. I figured with Supanova coming up this week in Perth, Oz Comic-Con in Melbourne the week after and SDCC fast approaching, why not delve into it for you lovely readers. I’m relatively new to the commissions and original art game. 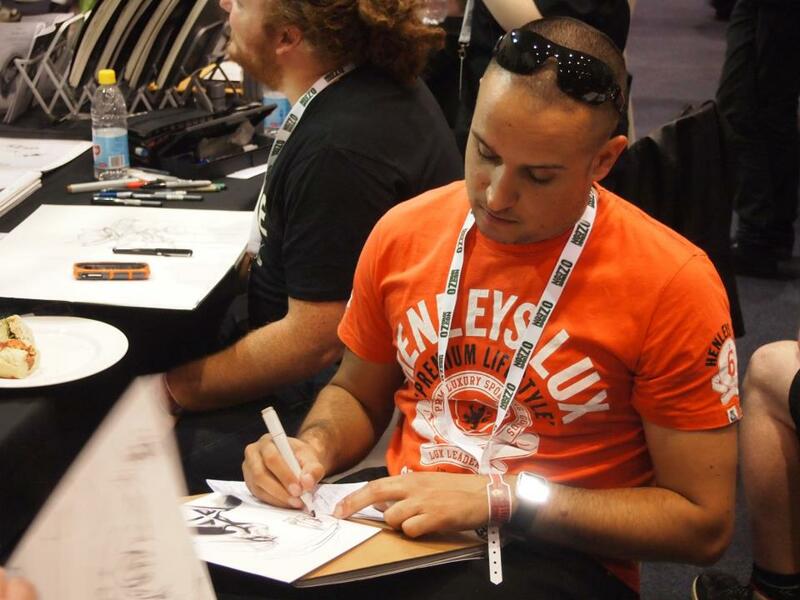 My first foray was at Oz Comic-Con in Melbourne last year. I was there to meet Stan Lee above all else but I was also very keen to see to get some time with DC artists Nicola Scott (Secret 6, Earth 2) and Francis Manapul (The Flash). I got there early, super early. My Excelsior pass got me in the door a little before the rest but even then there were already a bunch of people queued at the artist’s desks. These guys are really into it. Carrying large art folios or sketchbooks showing off their many pieces. We chatted as we waited for the guests to arrive. Most were pretty nice guys, although a few were a bit standoffish. Focusing on getting their piece above all else, and not wanting anyone else to get there first. This is the minority, though, most are happy to talk comics and show off their folios. It was really fun later at the con bumping into people I saw in the queue and comparing pieces. “You got the Batman I saw him working on? I love it!” It’s a fun little side culture to the convention scene. See, getting there early is an absolute must. Most artists will have a commission list. Getting on that, and as high as possible on the first day on the con is key. They will do pieces right there during the con, working down the list. The higher you are, the more chance you’ll get your turn before the weekend is up. This goes for the majority of artists I’ve encountered. Some, like Francis Manapul wont take a list; he will work through the queue. I personally waited 3-4 hours and watched him do 2 whole pieces before I got my chance. Not that I’m complaining, mind you, watching the artist work and create something amazing in front of you is a pure delight. In come cases, really big artists like George Perez will open their list on their website of Facebook many months before the convention. Act fast, and get in there quick. I've also seen really popular guys use a lottery system from the names they've taken down or picking and choosing from the list based on what they'd like to draw today. A Booster Gold may be more appealing than the 80th Iron Man you've drawn this week. When you get there have your choice of character already made. Nothing worse than getting there and umming and ahhing. There’s not really any restrictions to what character you can get. A DC artist will happily draw a Marvel character and visa versa. If the character is obscure or you want a very specific look its always good to bring a reference for the artist. It will make their job a lot easier. 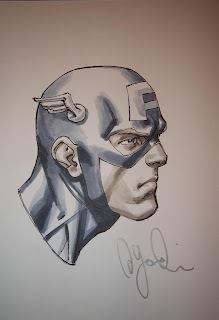 In Singapore I saw Mark Brooks do a portrait of the guy buying the commission so, there aren’t really any barriers. I’m always in two minds on character choice. Do I want the character the artist is known for or something out of the box? 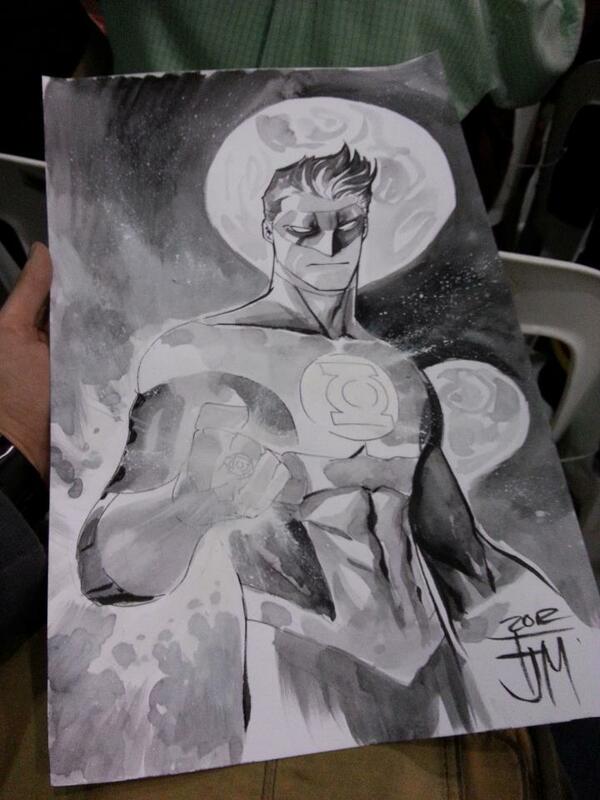 When a guy draws The Flash 300 days a year, would it nice for him to draw, say, Green Lantern who he rarely draws? Or do I want that Wonder Woman because she is really known for it? It’s a hard decision. A piece can range from $50 up to $400, depending on the artist and the size of the piece. There’s no hard rate. It’s their call. It’s worth browsing sketchprices.com beforehand. It’s a site where fellow collectors post what artists are currently charging. It’s super helpful. If you can't afford a full piece, it’s easy enough to get something smaller like a bust that’s easier on the wallet (and still gorgeous). Also a super quick sketch is usually available for free if you are getting something signed and are super nice. Always have the cash on you in advance. These guys aren’t going to have EFTPOS. Also, don’t baulk at the prices. 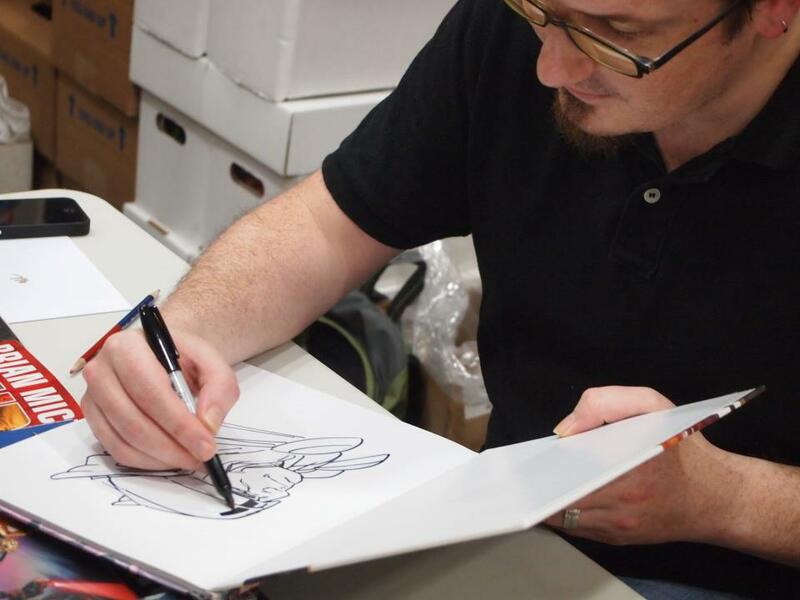 A comic artist, even one for Marvel or DC, don’t earn massive amounts of money. I know a few who use the commissions to literally pay for their trip and spending money when they get here. Be nice to your artist. They are stuck there all day at this con drawing and would love to have a chat. Talk comics to them, hell talk anything to them. Praise their work; tell them your favourite panel they’ve drawn. Ask questions. Never critique them to their face. This isn’t the internet, don’t be mean. Make this a positive experience. It will pay off. I’ve had people like Andy Tong or Matthew Clark take my number and call me when my piece is done when I’ve had to leave. Heck, Matthew invited me to pick mine up from his hotel 3 days after the con. They’ll remember the really friendly fans when they see them again. I've had great chats with Nicola Scott and as a result was able to get on her list before the next con I saw her at even started. 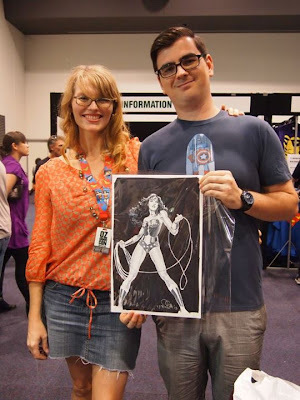 Mark Brooks and his wife are really great sorts and I really enjoyed getting the opportunity to interact with them and Nicola Scott is the nicest, most genuine lady in comics. Network and be awesome. It’s also a good idea to bring something to store your new work of art in. One of the most stressful experiences in my life was running through the convention hall in Melbourne with a fresh, still wet, Manapul Green Lantern commission above my head. Thankfully no harm came to it, amazingly. If you are nice some artists will let you keep it in their booth until you are ready to head home. Of course the trip home is just as treacherous. So an art folio or something similar is a must. A full size piece is 11x17”, which is quite large. I don’t really like to roll things up either, keeping them straight and crisp is much nicer. Although, that makes bringing art home on a flight home a wee bit difficult if the flight staff aren’t helpful. So you have your wonderful new piece of art. What now? Tell the artist how much you love it, shake their hand and get a photo with them. They are always more than happy to. Do remember the artist will never likely see this piece again. Nicola Scott was so happy with the Wonder Woman she drew me this year that she told me to scan it and tag her on Facebook with it. 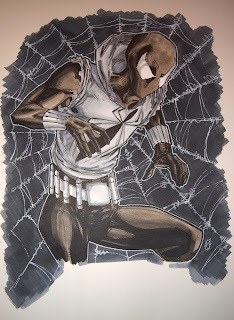 There’s a great social network for this called Comic Art Fans. It’s a place to share and comment on all the wonderful commission work going around. It’s a great research tool when picking an artist or picking who you want them to draw. You can find my profile here. Although in posting that link I remember I haven’t posted a fair few of mine. Also, do check out the smaller and local artists. These guys may not have the profile of a DC or Marvel artist but their work is always really great, and priced a lot easier on the wallet. Who knows, in 5 years they may be a superstar in their field. I met the awesome Andie tong at STGCC in Singapore last year. He's been an artist for the Spidey UK series. I had never seen his art before and fell in love with it instantly. 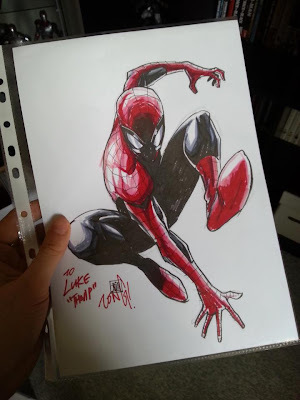 His Spidey is now among my favourites and the below commission has a spot of pride in my geek den. 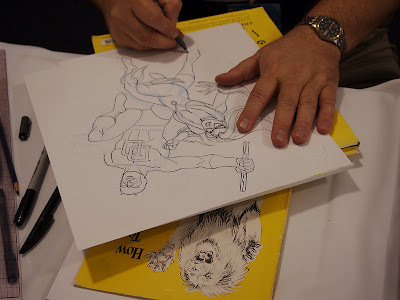 Remember these tips and you may just come home with a piece by Mark Brooks or George Perez this weekend. Hopefully not in front of my name on the list! A great and helpful little blog. Nice work. Awesome! My first commission was from the awesome Tony Moore (he did an amazing job at the piece). 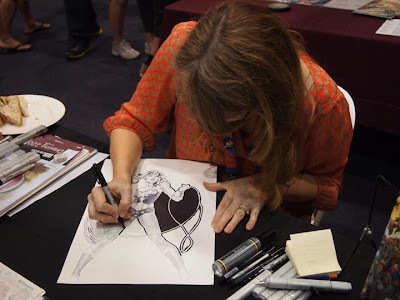 Do you remember how much Nicola Scott charges for commissions?